Our tour will safely guide you around the beautiful landscapes of Far North Queensland, giving you the chance to see all the flora and fauna up close and experience one of the most beautiful parts of Australia. Ride though rainforest, wetlands, native bush and cane fields for an authentic and memorable experience that is suitable for the whole family on both horseback and ATV for a truly unique and fun day! See Australia on a day full of fun and thrill with Cairns Horse Riding and Quad Bikes. Offering both full day and half day tours at Blazing Saddles, you can pick and choose what suits you so you can best enjoy your holiday. With both horseback riding and quad bikes on the agenda, you'll enjoy the thrill of riding through the beautiful rainforests outside of Cairns with your family and friends. See diverse landscapes, as well abundant animal and wildlife, with a chance to spot a crocodile in the wild! Geese, birds and amphibians are sure to mark the way, with the natural environment surrounding you to keep you in awe for your whole tour! Located only 10 minutes from town, you can easily fit this into your next holiday and leave with memories to last a lifetime. 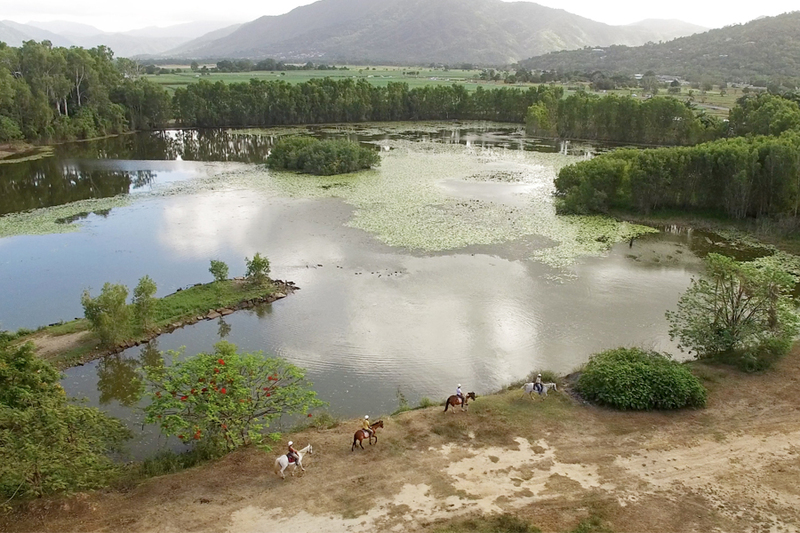 This tour is great for couples, families and even larger groups and there are horses for all levels of comfort, as well as suitable ATVs for all types of drivers, so there is no experience necessary. We'll pick you up at your Cairns CBD accommodation to head to Blazing Saddles where you'll be briefed for safety instructions and be fitted for gear and helmets. Next you'll be assigned a horse or ATV, depending on the tour, before heading out. Enjoy your morning or afternoon with friends, family and guide before returning to camp for tea and coffee. Afterwards, we'll drive you back to your accommodation. Please note for full day tours, cafe style food is available for purchase with unlimited tea and coffee. Cairns Horse Riding and ATV will provide everything you'll need for a fun-filled and enjoyable tour of beautiful, tropical Queensland. With meals, photos and a safety briefing provided, all you need to do is have fun and enjoy the ride. Minimum age is 4 years - no experience necessary and children under the age of 12 must ride in the 4 person ATV with the tour guide. Half-day tours depart at 8:45am, 10:45am and 12:45pm with full day tours departing at 8:45am and 10:45am to accommodate for both horseback riding and ATV activities. Ask us about half day horseback or ATV fours, or full day horse riding or ATV tours. Customers are required to sign a â€˜waiver of liabilityâ€™ form. All client cancellations forfeit 25% of total ticket price and all client cancellations made less than 21 days prior to departure will result in a 50% forfeit. Cancellations made within 48 hours will not issue any refund. If the tour provider has to cancel the trip and we cannot offer a suitable alternative, then a refund will be given minus card fees. We strongly recommend that you have travel insurance, especially during the wet season. Please note it is the responsibility of ALL guests to advise both your travel agent at the time of booking and vessel check-in agent before boarding of ANY medical conditions including food allergies you may suffer from.